"These fantastic grilled potatoes will have everyone eating the skin! But be careful, no other baked potato will do after this. So be prepared to make it again." Preheat an outdoor grill for medium-low heat. Prepare four foil squares large enough to fold over one potato each. 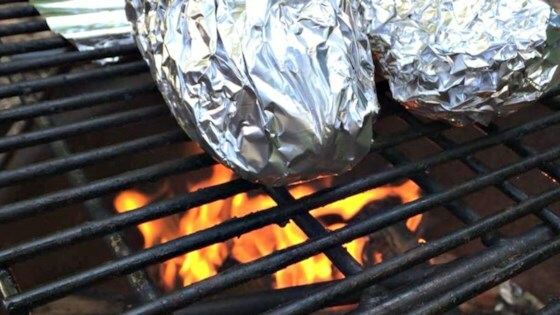 Spread butter onto foil in a large enough area that the potato will be completely covered when rolled up. Sprinkle salt, garlic, pepper, and Italian seasoning evenly over foil. Roll each potato in the foil; puncture the package (including the potato) with a fork or knife a few times. Grill for 1 hour, or until soft, turning the potatoes often. Serve with your favorite toppings. This was just like any other baked potatoe to me! My husband got disapointed when he tasted them 'cos I had told him these would be the best ever. I cut the potatoes up into wedges because I didnt want to wait an hour for them to cook. And I added some parmesan cheese. I love all the flavour in these. I will make these all the time. These are the best baked potatoes. I made these twice this week. Followed the recipe exactly minuse the Italian herbs. Did no cook on grill but in oven at 350 for 45 minutes. Nice twist on an old familiar. I brushed the foil with olive oil instead of butter. The potato skins were soft and had great flavor.